The cliffside roads we travel lack shoulders or guard rails. 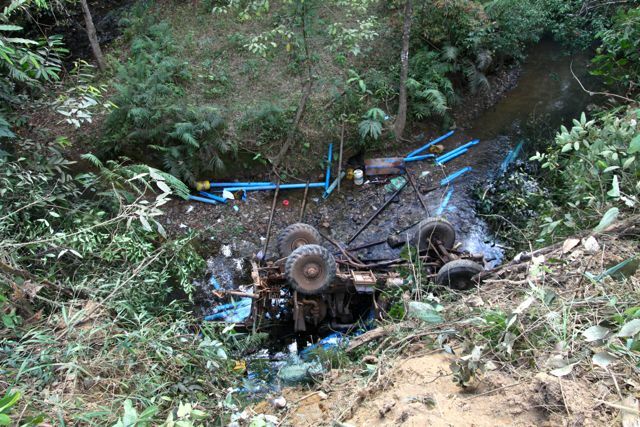 This truck was driving after dark and plunged down an embankment, killing three. We'll never know the exact cause of the accident. Did the driver misjudge his speed and lose control? Did the brakes fail? 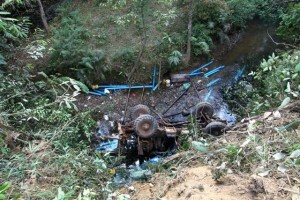 For good reason most aid agencies require their vehicles to be off the roads when darns falls. Last night a truck misjudged a curve and went airborne over a deep ravine. It ended its flight upside down in a stream, its skyward pointing tires about the only clue that the wreckage was once a truck. Three victims were found, deceased, in the morning; the men either perished in the crash or suffered in the aftermath and died in the dark. Most of the international aid agencies working in Laos follow a common safety procedure; they insist that their drivers and vehicles be off the road before dark. The one-lane, dirt-packed roads here in Sekong Province wind up and down mountainsides, one hairpin turn after another. The consequence of a mental lapse, a blown tire, or a rockslide could be a flight off the roadway and a tumbling crash a thousand feet to the bottom of mountain. I’ve driven many miles over the roads here in Dak Cheung District and I’ve yet to see a patch of pavement or an inch of guardrail. An accident after dark would likely leave victims with no assistance until the break of day. You don’t call 911 here. You solve your own problem. Help does not come to you; you make your way to help. Earlier in this project one of our trucks and most of our team went missing after dark and was a no-show at our agreed upon destination. Having no cell phone coverage there was nothing to do but wait for morning light and start searching the roads that the truck most likely traveled. Luckily, by investigating the rumor of a truck stranded several miles from town, we found our teammates working to dig the truck out of the mud. We joined in the work of freeing the truck, relieved that the men were all safe. Better to find them stuck in the mud than at the bottom of a cliff. We Help War Victims is a registered 501 (c) (3) public charity under the US Tax Code. WHWV is sustained by a broad network of friends and supporters. Financial support comes from individual donors and organizations such as school groups and religious congregations. Contributions to WHWV are tax deductible. WHWV has no paid administrative staff.